Come Thursday morning, I'll have me something figured out, not definite but just about that I can make the cut. And I'm betting on Sunday, that I'll be fishing solo, just me and my cameraman Joe, and with a little bit of luck, I'll have just enough. While covering a Bassmaster Elite Series event a few years ago, a B.A.S.S. staffer handed me a DVD containing a music video produced by one of the anglers competing in that week's event. "You might want to watch this," she said. "It's pretty good." As it turns out, the country song entitled Fisherman was indeed pretty good. 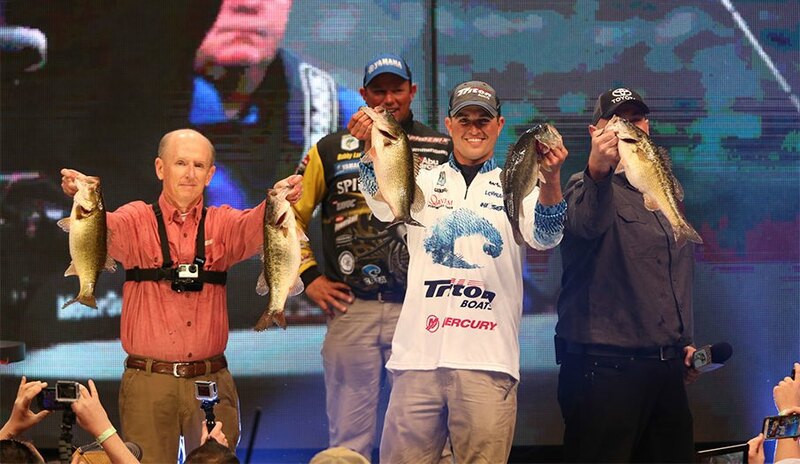 And so, too, was the fisherman crooning the lyrics on that DVD, Casey Ashley, who on Sunday evening capped three days of superb fishing on his home water of Lake Hartwell and captured one of the top prizes in all of fishing, the 2015 Bassmaster Classic Championship. With thousands looking on and cheering loudly for South Carolina's favorite angling son, Ashley won the 45th edition of the Classic and its $300,000 first place check after bringing a five bass limit to the scale at the Bon Secours Arena in his hometown of Greenville, S.C. When those fish pushed B.A.S.S. weigh-master Trip Weldon's digital scale to 20 pounds, 3 ounces, it was the second biggest bag weighed in during the three-day event. That tally pushed Ashley's 2015 Classic total to 50 pounds, 1 ounce and knocked Major League Fishing angler and eventual runner-up Bobby Lane from the Championship Day hot seat on stage. After Lane fell from the chair in disbelief – he would finish more than 3 pounds behind Ashley with 46 pounds, 15 ounces and earn $45,000 for his work. The Florida pro must have been left wondering how this had happened to him yet again. Lane, a one-time winner on the Bassmaster Elite Series and the brother of 2012 Classic champ Chris Lane, finished in fourth place at the 2008 Classic, also held on Hartwell, behind the event's winner Alton Jones, a Major League Fishing pro from Texas. When Ashley shook Lane's hand, he climbed into the Championship Day's hot seat and admitted to B.A.S.S. emcee Dave Mercer that he was far from the calm, cool and collected angler who had flashed his bright smile to the crowd and cameras all week. "Every day (out there), I could see it getting closer and closer and closer," said Ashley. "I've - been cool and calm all week, but when I put the boat on the trailer today, I became a nervous wreck. I'm still a nervous wreck – but how about Greenville, S.C.? Y'all filled this place up (today)." That it was. In fact, Dave Precht, the VP of publications and communications for B.A.S.S., would announce on Sunday evening that the 2015 tournament was the third most attended Classic of all time with a combined attendance total of 103,091 people going through the turnstiles of the Feb. 20-22 event. That attendance figure puts this week's Classic behind only Shreveport's 137,000 in 2009 and Tulsa's 106,000 in 2013. And many of those 103,000-plus were there on Sunday evening to sweat it out with the hometown hero Ashley as he watched the weighing in of the remaining anglers comprising the 2015 version of the Championship Day's "Super Six" finalists. That "Super Six" field, which included Ashley, was a veritable who's-who list of angling powerhouses in the sport including 2014 Classic champ and MLF pro Randy Howell, 2004 Classic champ and MLF pro Takahiro Omori, 2003 Classic champ and MLF pro Mike Iaconelli, four-time B.A.S.S. tournament winner and MLF pro Dean Rojas and multiple B.A.S.S. and FLW Tour tournament winner Brett Hite. "I tell you, I've dreamed of this since I was a kid," said Ashley to the weigh-in crowd at one point. "It's been my dream of winning the Bassmaster Classic, but you never really dream of winning the Bassmaster Classic in your hometown and on your home lake. "I don't know what they've got (the Super Six finalists)," he added. "I really don't (know). But I do know that they're all scary (as anglers)." While there was no doubt that Ashley's statement about the angling prowess of the other anglers he was up against was true, one by one they all came to the scale and fell short of Ashley's benchmark. And when Omori, the last angler to weigh in on the day, came to the stage on Sunday evening, you could almost see the resignation in his face that he knew he didn't have enough to beat Ashley. When the numbers settled on Weldon's weigh-in scale, Omori's catch was officially not enough and Ashley began to celebrate with the crowd roaring their approval as emcee Mercer proclaimed Ashley the 2015 Bassmaster Classic Champion. A few moments later, with confetti being shot high into the air, Ashley would hoist the 2015 Classic Championship trophy. In doing so, he would celebrate his career's biggest triumph and payday, a win that would push Ashley's career earnings in B.A.S.S. events to more than $1 million dollars. What's more, Ashley's Classic triumph – the third by a South Carolina pro, along with Hank Parker's 1979 triumph on Lake Texoma in Texas and Davy Hite's 1999 win on the Louisiana Delta – cements the 31-year-old pro's claim to being one of the best pro anglers on the planet. With his 2015 Classic win, a 2014 FLW Tour triumph (also on Hartwell), and three Elite Series victories (including a 2007 win on Virginia's Smith Mountain Lake where the then 23-year-old Ashley became the youngest angler to ever win an Elite Series event), and there can be little doubt that Ashley is as good as anyone else in the pro angling game at the moment. That was certainly true on Hartwell, despite topsy-turvy weather conditions that saw frigid temperatures on Friday (with a Classic record low temperature of 10 degrees to start the event) turn into occasionally rainy and milder readings in the 50s by Sunday. But weather or not, it was a magical week for Ashley who started the event with five fish weighing 15pounds, 3 ounces – good enough for sixth place on Friday despite the severe cold. On Saturday, Ashley weighed in five bass at 14 pounds, 11 ounces on yet another chilly day, good enough for fifth place after two days. And on Sunday, as milder weather finally prevailed, he had a day that all anglers dream about, weighing 20 pounds, 3 ounces to overtake everyone and win the Classic title. "I wanted to be a professional fisherman since I can remember," Ashley would say at one point on Sunday evening. "And I wanted to win the Bassmaster Classic. Not only did I win it, I won it right here in my hometown, on my home water, in my home state. "Indeed he did. Something that the excited and humble young man from Donalds, S.C., showed as he clutched the Classic Championship trophy. "I can't even explain it, (how I feel right now)," said Ashley to the crowd. "I tell you, I'm so thankful for all of the support I've gotten this week. And I have to thank the Lord (above) for looking out for me (this week). "This is a dream come true, it really is." A fisherman's dream that sounds just like the song that Ashley croons and is so well known for. Going to back this boat into the water, find a way to win a couple of dollars, weatherman says there's a cold front coming down, bring it on, I've seen it all by now. I can catch 'em shallow, I can catch 'em deep, open water or the back of a creek, wind and rain, to me it's all the same. I make a living playing this game and I thank the Lord above every time I can, I get to be a fisherman. A Bassmaster Classic winning fisherman, no less because for Casey Ashley, such a career accolade is no boyhood dream any longer, it's a storybook reality.